Winners of Chancellor's Awards for Excellence: First row, from left, Teri Frese, Susan Benoit and and Dr. Steven Stehman; back row, from left, Dr. Charles Kroll and Dr. Kelley Donaghy . A number of employees of the SUNY College of Environmental Science and Forestry (ESF) were honored for their contributions to academics, the campus community and service to the State University of New York. 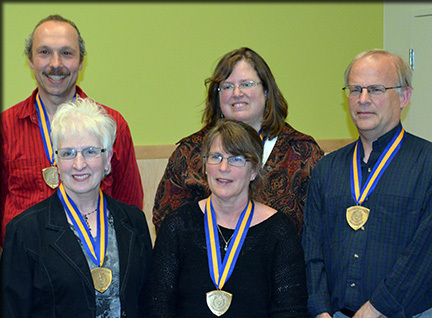 Five employees received SUNY Chancellor's Awards. Dr. Stephen V. Stehman, a professor in the Department of Forest and Natural Resources Management, received the Chancellor's Award for Excellence in Scholarship and Creative Activities. The award recognizes outstanding academic and creative achievements across a broad spectrum of scholarly and artistic fields. Stehman joined ESF in 1989 and has an outstanding record of research productivity, maintains a heavy teaching schedule and has given presentations at numerous academic symposiums and conferences. He has secured more than $500,000 in grants in the last five years and serves on a number of steering committees for graduate students. Dr. Kelley Donaghy, associate professor in the Department of Chemistry, received the Chancellor's Award for Faculty Service, which recognizes outstanding achievement and skill in providing leadership, service and assistance to the university, community and profession that exceeds expectations. Donaghy has been a member of the ESF faculty since 2006, teaching introductory general chemistry. She developed a Service Learning Track for general chemistry students, finding ways to incorporate an element of chemistry into campus service projects. She is involved with the American Chemical Society, serving as a chemistry coach at Fabius-Pompey school and chair of the ACS' Education Committee. She is also the executive chair of ESF's Faculty Governance and chairs several campus committees or subcommittees. Dr. Charles Kroll received the Chancellor's Award for Excellence in Teaching, an award that honors those who consistently have demonstrated superb teaching at the undergraduate, graduate or professional level. Kroll joined the ESF faculty in 1996 and served as chair of the Department of Environmental Resources Engineering from 2008 to 2011. His hands-on approach to teaching has earned him the respect and admiration of his students. He keeps extensive office hours for one-on-one and group student advising. Kroll uses a variety of teaching techniques in his classes to keep students engaged and interested and has developed new courses to meet student needs. Students consistently give Kroll's courses high marks for instruction, organization, motivation and enthusiasm. Susan E. Benoit, a senior staff assistant in the Office of Research Programs, was honored with the Chancellor's Award for Excellence in Professional Service. The award recognizes consistently superior professional achievement within and beyond the position and those who serve as professional role models for a university system in the pursuit of excellence. Benoit began her appointment at ESF in 1995. Benoit serves as a guide and assistant to faculty and staff when they prepare and submit proposals for sponsored research and projects, and the administration of grants and contracts secured from sponsors external to the college. Benoit was recognized for her consistent superior performance and outstanding capacity for undertaking the continually expanding duties of her position. Teri Frese, secretary 1 in the Department of Environmental Resources Engineering, received the SUNY Chancellor's Award for Excellence in Classified Service. The award is given to University Classified Service staff who have consistently demonstrated superlative performance within and beyond their position. Frese has been with ESF for 18 years. She consistently excels in her present position, demonstrating creativity and flexibility in her work, and delivering exemplary customer service. She also extends herself into other activities to create a more joyful and sustaining workforce for the department. She is a member of the Friends of Moon Library and the Employee Assistance Program. Drs. Charles Maynard, Department of Forestry and Natural Resources Management, and Dr. William Powell, Department of Environmental and Forest Biology, were named ESF's Exemplary Researchers for 2014-2015, for their groundbreaking work to restore the American chestnut tree. The recognition comes with a $5,000 research account and a presidential salary adjustment. This college-level award recognizes successful, currently active researchers with exemplary research activity, publication records and graduate/undergraduate student mentorship programs. Maynard and Powell will present a campuswide research seminar highlighting their work as the first seminar in the Adaptive Peaks Series during the 2014-15 academic year. At that time they will be presented with a plaque recognizing this achievement and a reception will be held in their honor. Dr. Gary M. Scott, chair of the Department of Paper and Bioprocess Engineering, received the 2014 ESF College Foundation Award for Exceptional Achievement in Teaching. In addition to chairing the department, Scott is director of the ESF division of engineering and assistant provost for assessment and academic initiatives. In receiving the honor, Scott was praised for his dedication to his students' success and for establishing a professional and constructive learning environment. The award, presented annually since 1999 by the ESF College Foundation, Inc., celebrates the accomplishments of ESF faculty members who excel at the art of teaching. The Foundation provides winners with a personalized recognition plaque and a cash award of $1,000. A permanent plaque displayed in Bray Hall Rotunda lists the names of all previous recipients. Barb Sorrells, secretary 1 in ESF's Physical Plant, was honored with the campus Quality of Worklife Award in recognition of her contributions to the college, exemplary performances of duties beyond expectations, and involvement in campus activities. Emanuel Carter, Jr., professor in the Department of Landscape Architecture, received ESF's Public/Community Service Award in recognition of contributions made on behalf of the college to the community through public/community service.